Recently the University of Pittsburgh Nurse Anesthesia Program was voted #1 Graduate Nurse Anesthesia Program by the US News & World Report. The University of Pittsburgh School of Nursing, Nurse Anesthesia Program prepares registered nurses for entry into anesthesia practice. Graduates are prepared to administer a full range of anesthetics to a wide variety of patients. 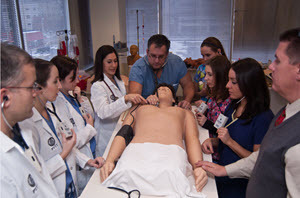 Through an integrated program of classroom, simulation and clinical instruction, students develop the didactic knowledge base and clinical skills necessary for safe and effective practice. WISER Associate Director, John O�Donnell, RN, CNRA, MSN, DRPH is a Professor and Chair of the Department of Nurse Anesthesia. Congratulations to Dr. O�Donnell and all of the faculty and staff at the Nurse Anesthesia Program.